2005 LEXUS RX330. CLEAN CARFAX. 3.3L V6, AUTOMATIC, ALL WHEEL DRIVE. FULLY LOADED WITH LEATHER SEATS, HEATED SEATS, POWER WINDOWS, MIRRORS AND SEATS, SUN ROOF, 6 DISC AM/FM SOUND SYSTEM, POWER REAR HATCH, PRIVACY GLASS, 18'' ALLOY WHEELS WITH RECENT MICHELIN TIRES AND MORE. TIMING BELT WAS REPLACED AT 91K MILES. VERY RELIABLE VEHICLE. 135K MILES. 90 DAY/3000 MILE WARRANTY INCLUDED. ALL FOR $8995. EASY FINANCING AVAILABLE $0 DOWN AND $49 PER WEEK. 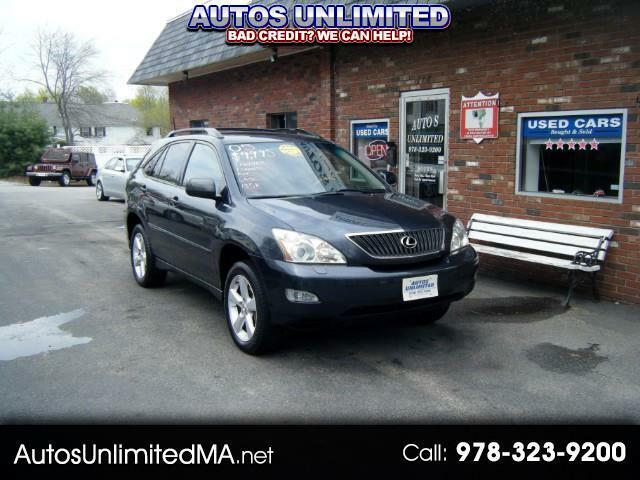 FOR MORE PICTURES, INFO AND TO APPLY ONLINE PLEASE VISIT AUTOSUNLIMITEDMA.NET OR CALL AUTOS UNLIMITED 978-323-9200. IF YOU PREFER TEXTING PLEASE TEXT 978-726-4107. THANK YOU. You promise to pay us the principal amount of $8,995.00, plus a time price differential accruing on the unpaid balance at the rate of 0.00 % per year from today's date until maturity. The time price differential accrues on a 365 day basis. After maturity, or after you default and we demand payment, we will earn finance charges on the unpaid balance at 0.00 % per year. You agree to pay this Contract according to the payment schedule and late charge provisions shown in the TRUTH IN LENDING DISCLOSURES. You also agree to pay any additional amounts according to the terms and conditions of this Contract.